The winners were announced at the 11th annual Massachusetts Family Business of the Year Awards program on June 14, 2017, at the East Village on Northeastern University’s Boston Campus. PSD won for the Medium Firms category. 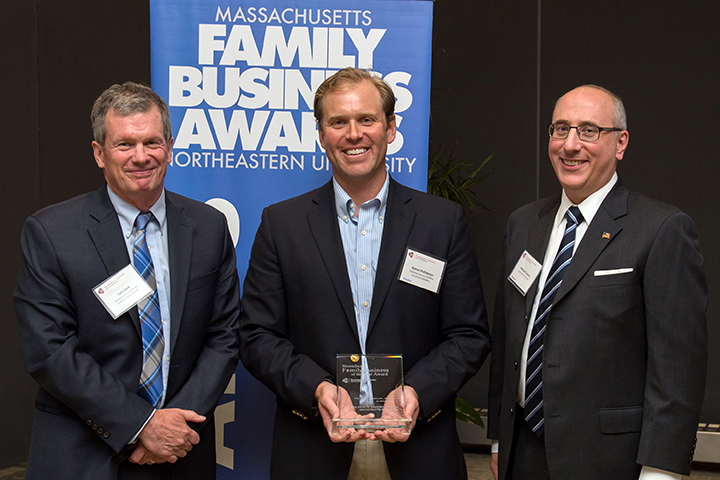 The Massachusetts Family Business Awards program, hosted by Northeastern University Center for Family Business, promotes and highlights the great achievements of Massachusetts-based, family-held businesses and entrepreneurs. Each year, family businesses across the state are recognized in five different categories ranging from small businesses to community involvement. The recipients are selected by a panel of independent judges based on business success, positive business and family linkages, multi-generational family involvement, contributions to the community and industry, and innovative business practices or strategies. PSD was this year's recipient of the Massachusetts Family Business of the Year Award in the Medium Firms category. Photo: Polhemus Savery DaSilva’s Aaron Polhemus accepts the Massachusetts Family Business of the Year Award for the Medium Firms category. From left to right: Ted Clark, Director of Northeastern University Center for Family Business; Aaron Polhemus, President & CEO of Polhemus Savery DaSilva; Michael Cecere, Partner at Gray, Gray & Gray Certified Public Accounting Firm, Sponsor and Presenter of the awards.